Spider-Man: Turn Off the Dark just can’t catch a break: in response to Monday night’s onstage accident, in which stunt actor Christopher Tierney fell from a ledge and was hospitalized in “serious condition,” the Broadway musical has postponed today’s matinee performance to evaluate new safety measures. The evening performance is still scheduled to run. The troubled show, which is scheduled to open in February, has experienced several injuries since it began production in November. That month, actor Kevin Aubin fell during an aerial stunt, breaking both of his wrists. Earlier in December, actress Natalie Mendoza, who plays Arachne, reportedly struck in the head by a rope during a preview performance. Actress Jenn Damiano, who plays as Mary Jane Watson, has said resignedly of the dangers: "I think everybody knows what they signed up for." 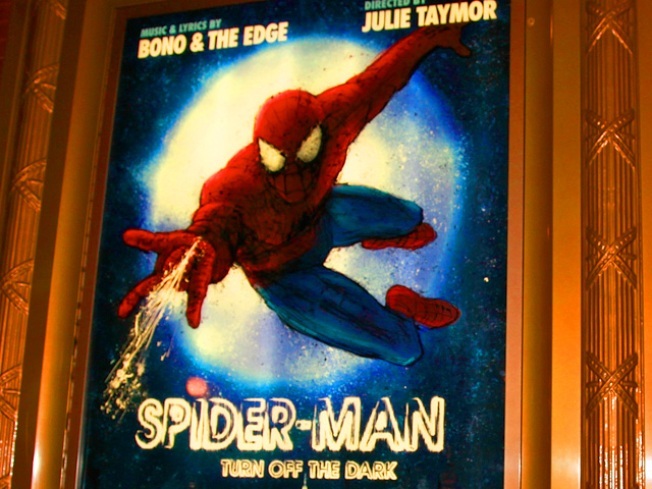 Spider-Man: Turn Off the Dark is directed by Julie Taymor, with music and lyrics composed by Bono and the Edge. Here’s hoping no more injuries occur from now on.